Canon’s Pixma MX892 Wireless Inkjet Office All-In-One color inkjet multifunction printer (for printing, copying, faxing, and scanning) is suitable for a home or very small office. It delivered good output quality in our tests, and supports both automatic duplex printing and scanning, for a reasonable $200 (as of April 27, 2012). It's also handsome, solidly built, and moderately fast. Among its shortcomings are an awkward control panel and an absence of high-yield replacement ink cartridges, which other office-minded models in the same price range make available. Setting up the PixmaMX892 is easy; and the MFP supports USB, ethernet, and Wi-Fi connectivity. You can set up Wi-Fi via WPS, though the 3-inch LCD gives you the option of selecting a network and entering a password to accomplish the same setup. Canon bundles its Solution Menu EX software, a capable package that handles everything from photo albums to scanning. You may push-scan to your computer from the PixmaMX892's control panel or offload scans via USB/PictBridge, Memory Stick, Secure Digital, or Compact Flash media. You may also print directly from media inserted into these ports. The Pixma MX892's paper-handling features are very good. In addition to a 150-sheet main tray, it has a rear vertical feed that can hold 150 more sheets. Canon also includes an automatic duplexer, and a 35-sheet automatic document feeder (ADF) for the scanner. The ADF scans duplex, so you don't have to double-feed two-sided documents by hand. The flatbed scanner is letter-/A4-size, and the lid telescopes to accommodate thicker material. The Pixma MX892's control panel features a grid of black buttons that, depending on how you use the unit, light up as the okay and cursor keys, or as a numeric keypad. Three function buttons act as shortcuts, sometimes; at other times, you have to use the okay and cursor keys. The Pixma MX892's performance is quite good. It prints monochrome pages at a sprightly 8.1 pages per minute from the PC, and at 8.3 ppm from the Mac. Snapshot-size (4-by-6-inch) photos print at about 3.2 ppm on plain paper, and 1.9 ppm on glossy photo paper. Full-page photos, printed on the Mac, exit in just under two minutes. Scan and copy speeds are adequate. The Pixma MX892 uses a five-tank ink system consisting of black, cyan, magenta, yellow, and photo black. The $16 black lasts for an estimated 339 pages, yielding a cost estimate of 4.7 cents per page. Each color cartridge costs $14. The cyan, magenta, and yellow cartridges last for anywhere from 486 to 555 pages, and a page with all four colors an estimated cost of around 13 cents. The photo black should last for 666 4-by-6-inch photos, per Canon’s proprietary tests (or contributes a minuscule amount to regular documents). 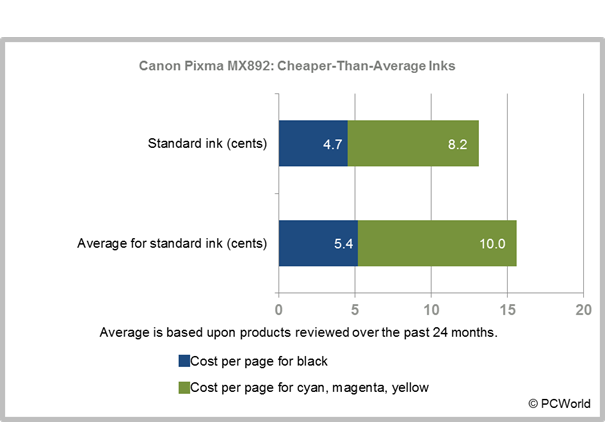 To the Pixma MX892’s credit, these ink costs are cheaper than average for standard-size cartridges. Given the way the market for small-office inkjets is heating up, however, the Pixma MX892 lacks one key attribute: high-yield inks that offer greater savings for higher-volume use. Both the $200 Epson WorkForce 845 and the $170 HP Officejet 6700 Premium offer high-yield ink choices. Output quality from the Pixma MX892 has the same warm (and slightly orangey) color temperature that most of the company's printers feature. With most subjects, this imparts a friendly vibe to graphics and photos, but faces and flesh tend to look oversaturated. The effect is more noticeable on plain paper than on glossy paper. Dark areas tend to show more detail than prints do that are made with less expensive Canon printers that lack a photo black cartridge. Text is quite sharp, even in draft mode, though solid areas tend toward charcoal-gray rather than true black. The Canon Pixma MX892's automatic-duplex printing and scanning are great, as are its sturdy construction, output, and speed. It would nicely serve one or two people who print at a light to moderate volume. Nevertheless, like-priced competitors from Epson and HP offer similar or better features for roughly the same price, with the option to buy high-yield inks. This inkjet multifunction printer has good speed and appealing features for a small or home office, but some similarly priced competitors offer a better design or cheaper inks.